The Pinnacle Tutor Certification Program is targeted at both existing tutors and, individuals who are considering Tutoring as a professional career. Our certification programs help to increase the profile and credibility of a tutor, thereby improving opportunities for a rewarding career in the education. Pinnacle Tutor Certification: The Pinnacle Tutor Certification provides one of the most effective and comprehensive tutor certification programs in the industry. Our professional certification will not only increase your profile and credibility in the marketplace as a Tutor, but will also teach you about effective learning strategies, tutoring techniques, quality communication and industry practices. Benefits of the Pinnacle Tutor Certification: Increased professional profile & credibility in the workplace. Entry into a rewarding, high growth, recession proof industry. Learn professional & effective tutoring strategies & practices. 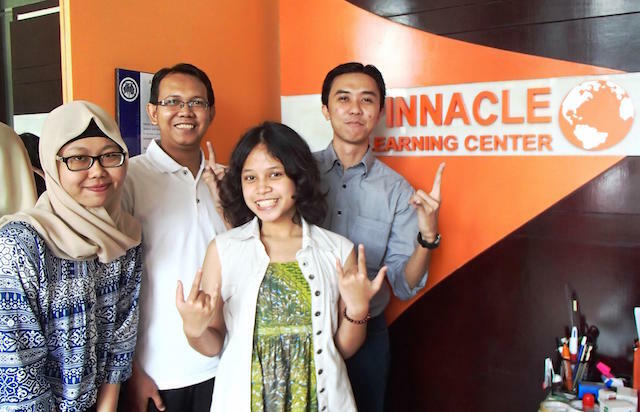 Strengthen your credibility through Pinnacle’s International Tutoring Association memberships. Opportunity to secure employment with Pinnacle at any of its Learning Centres. Hold an undergraduate degree in any discipline (S1). The Pinnacle Tutor Certification Program (TCP) is a 5 days training module. As part of the admission process, candidates will be required to undergo an Assessment Test. It is mandatory for candidates to pass this assessment before they can be selected for the enrolment process. Training is held at our Pinnacle Learning Centres and fees for the program are US$250 (payable in IDR) inclusive of Certificate and Registration.